Log in with your existing credentials, or sign up for a new account. Once you are logged in, in the top right corner of the screen, click on the circle with with your initials and select Upgrade. You will see a page with information on the Subscription Plans. Scroll to the very bottom of the page. 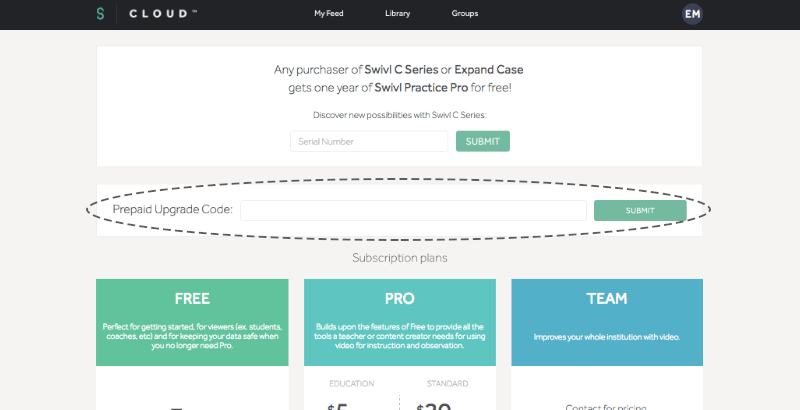 Copy and paste your Swivl Pro code into the Prepaid code field and click Submit. Your account will now be upgraded to the Pro version for the amount of time designated by your code.